Squat Toilets – Going The Way of The Dinosaurs? Where In The World Can Squat Toilets Be Found? Squat toilets are relatively unknown in the Western world. But they are commonplace in many other parts of the world. There is a surprisingly a large number of countries and cultures in Asia, the Middle East and Africa where squatting toilets have always been a part and parcel of daily life. The locations where squat toilets easily outnumber sitting toilets include the two most populous countries in the world today: China with a population of 1.3 billion and India, with a population of 1.1 billion. In fact, about two thirds of humanity (about 4 billion) still uses the squatting position for bodily functions. The rest – mostly people in the Westernised countries - uses the seated posture. In addition to Asia, Middle East and Africa, there are many regions in the world where squatting toilets can still be found. These include a number of European and Mediterranean countries, such as France, Germany, Italy, the Balkans and Greece. They can also be found in Russia and many countries in South America. They may not be exactly prevalent in some of the countries mentioned, but squat toilets do exist in many public areas, buildings and homes. Visitors may or may not encounter them in the newer or more developed areas of these countries. But you move away and go out to the more rural areas, you would find that squat toilets are quite common and widely used. Most of the world’s toilets, however, are largely concentrated in Asia. Countries like China, India, Pakistan, Japan, Korea, Mongolia, Sri Lanka, Thailand, Vietnam, Laos, Cambodia, Burma, Taiwan, Malaysia, Indonesia, Singapore. Of course, we must not forget countries in the Middle East and Africa. The peoples of these countries and continent have traditionally been using squat toilets since the beginning of time. Countries like Egypt, Saudi Arabia, Iran, Iraq, Israel, Kuwait, Mauritius, Sudan, Turkey, Uganda, Yemen, Zimbabwe. As a result of increased Western influence, sitting toilets are now making huge inroads even in countries which have a cultural tradition of squat toilets. Nowadays, too many people are giving up - by choice or circumstances beyond their control - squatting toilets for sitting ones. Few, if any, would switch from sitting to squatting types. If you think about it, a squatting toilet is nothing more than a hole in the ground. But different races and cultures have their own ideas and interpretations. Many of them have created their own designs and versions to suit their needs and lifestyles. 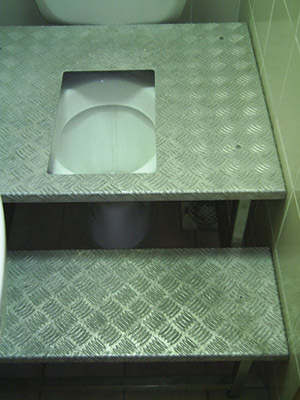 For example, Turkey has two kinds of squat toilets – ground level squat toilets known as alaturka. They also have pedestal squat toilets called alafranga (left) that has specially-designed foot rests that allows the user to squat on it at the height of a typical sitting toilet. The Japanese have a squatting toilet that has a unique shape with the user facing the toilet and flush device while his or her back is to the door of the stall. There is a Thai version which is somewhat of a different design in that it is a squat toilet, but has a bowl that is spiral shaped. While we have covered squatting toilets used in the "developed" areas of the world, there are specific locations where indigenous tribes or native peoples use some rudimentary version of 'squat toilets'. The toilets are often in the form of a squat style outhouse which does not come with running water or modern plumbing. Whether a person uses a squatting toilet or a sitting toilet is not always be a matter of choice or based on health considerations. In reality, for many, toileting posture is a culturally ingrained practice decided at birth. It also explains why some people who love squatting court danger by balancing and squatting precariously on top of a sitting toilet. Or why some would do whatever necessary in order to squat - even to the extent of constructing a metal platform over their sitting toilet, like the one shown in this picture. Although toilets that allows for squatting and sitting do not exist at the moment, that may change, if the idea of a sit squat toilet takes off.